Check out some of our available databases! 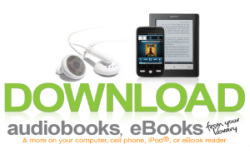 Download free audiobooks and eBooks, learn a language, discover car repairs and more with your De Soto Public Library card! Looking for your ancestors? Come stop by the De Soto Public Library to check out our digital database of the Dallas County News from 1866-2012. Is there a rare book/movie/publication/whatever you're trying to find? If it's on WorldCat, we can probably get it in for you--give us a call to request it today! Want info on Iowa authors, bookstores, book discussions and more? Check out the Iowa Center for the Book! Bureau, Iowa state agencies, and other state and federal sources.